We awoke to a slightly overcast day this morning with a stiff breeze blowing but still no sign of rain anywhere. Pretty remarkable really that we have been in the UK for more than a week now and the weather has been absolutely gorgeous the whole time. We wandered over to the new Tesco in Filey to pick up a few things and ran into Lindsay as she was on her way to the library. We gathered back at home central around lunch to plan out our afternoon visit to Flamborough. My mother opted out of our afternoon sightseeing trip deciding to look after a few chores around home. Our first stop was at the bird sanctury at Bempton Cliffs. The huge chalk cliffs rise high out of the sea at nearby Bempton, which is the site of the famous RSPB Bird Sanctuary. An awe-inspiring sight, the sheer cliffs are home to many bird species. In particular, during the season puffins may be seen in large numbers, in addition to the thousands of other nesting birds such as gannets and kittiwakes who make this the largest such colony in England. 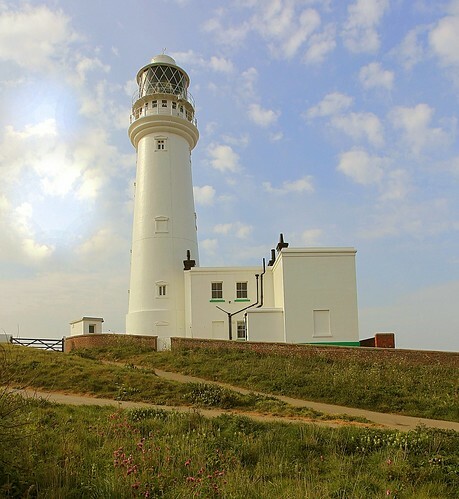 Constant pounding by the North Sea has eroded the soft chalk, creating many unusual formations, secret caves (a past haven for smugglers), and secluded bays and inlets, including the picturesque North Landing where the old Flamborough Lifeboat was housed at the top of steep slipway. We wandered around the cliff tops at Bempton for a couple of hours and managed to see lots of gannets and kittiwakes nesting on the cliffs. The few puffins we saw were far too far down the cliffs to get good photographs. The first three photos on today’s blog post are taken from the web. The rest of today’s photos were taken by yours truly. We were pretty well wind blown by the time we left Bempton for the short drive to Flamborough Lighthouse. We stopped at a small restaurant near the lighthouse for something to eat and a hot drink. We had a chip butty, bacon sandwich, chips & gravy and cheesy chips ordered for the four of us but were told after a few minutes that the restaurant had lost power…..so no food or drink for us. Oh well! Instead we continued on to the lighthouse where we walked out to the very edge of the cliffs. There were a few other intrepid walkers on the cliffs despite the definite bite in the air from the cool wind. We headed back for Filey where Lindsay prepared a wonderful supper including hamburgers, swiss cheese, portobello mushrooms and salad. We also polished off the rest of Casey’s birthday cake. Another great day in Yorkshire! 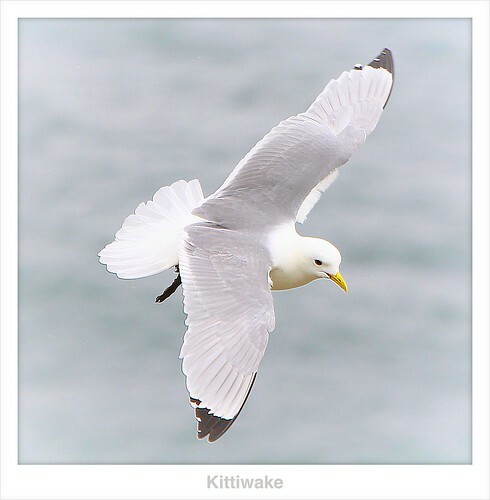 This entry was posted in Photography, uk, Wildlife, yorkshire. Nice pictures. It looks like a fun time. 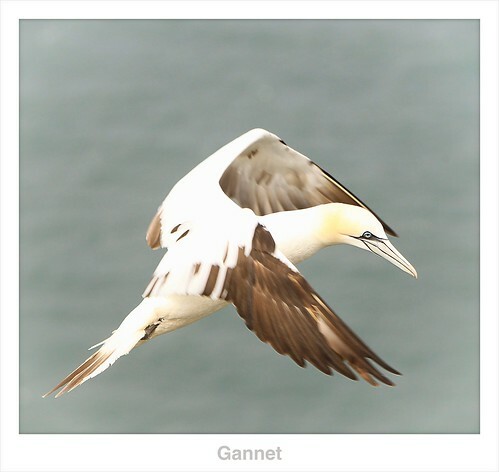 Love the gannet in flight … and of course, who can resist a lighthouse photo. We had our first opportunity to see puffins in Alaska last year … both the tufted and horned … such beautiful creatures. 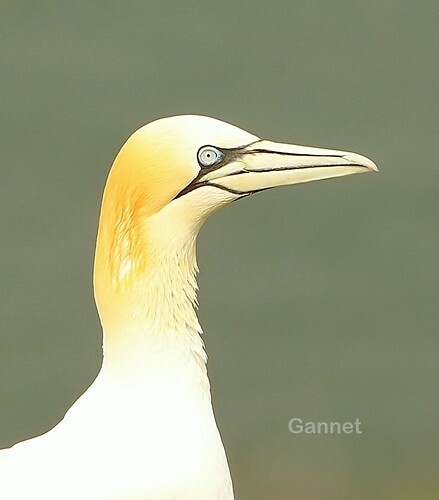 Wonderful photos!..The Garret almost didn't look real!..Love the outlined beak and freaky eyes…and the Puffins are amazing birds….Sounds like you're having quite a time!! !